HAVERHILL — They whipped up some cowboy caviar during one class, then some Halloween treats during another. But this month, the menu featured cookie dough brownies. 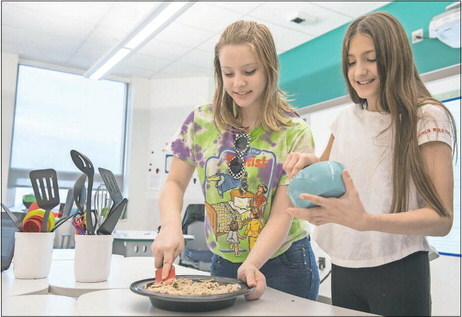 Students in Kimberly Surette’s seventh grade classroom at the Hunking School say a monthly project called “Cooking in the Classroom” is not only fun, but it’s an opportunity for some hands-on learning while drawing on academic skills such as mathematics, writing and researching the origins of their chosen recipes. 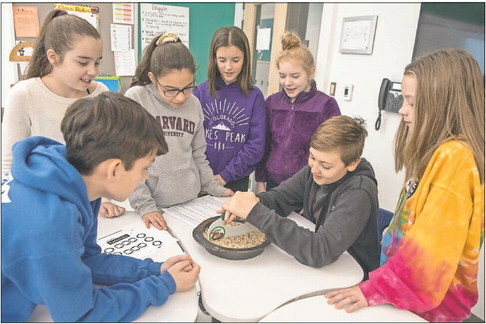 Surette, who teachers language arts and mathematics, says this form of project-based learning allows students to practice higher-level critical thinking skills and promotes meaningful learning experiences. “Working together, they must come up with a recipe, create a list of supplies, decide who will accomplish each task and how to present the project to the class using multimedia,” she said. Also taking part in the project were students in Michelle Paquette’s special education class. Surette received a $300 teacher mini-grant from the Haverhill Education Foundation to purchase all of the start-up equipment needed, including an electric hand mixer, food chopper, scale, mixing bowls, baking pans and cooking utensils. The foundation has been in existence since the early 1990s and is the only nonprofit organization specifically formed to support Haverhill’s public schools. Herb Bergh, vice president of the foundation, said his organization hands out a dozen of these grants each fall and a dozen each spring and has funded such groups as Haverhill High School’s robotics team, the Model United Nations program and the annual Write-Away!! contest. “They used math and language skills and also it gave them the task of putting together a multimedia presentation for the foundation’s board members, who got to see the grant in action,” he said. During a visit by Bergh and foundation members Kalyn Ryll and Tina Fuller, students Keira Bushey and Riley Moore presented a talk on the history of cookies. Riley said the first time cookies were made as test cakes, meaning they were supposed to be a different version of cake, but ended up making a cookie. Since their recipe this month was for cookie dough brownies, Keira and Riley had hoped to talk about the origins of this sweet treat, but after conducting an Internet search, they could not find what they were seeking. Using Google Docs, student Noah Ambrose had created a spreadsheet listing all of the ingredients. Hunking’s cafeteria workers helped by baking four batches of brownies in round cake pans, and when cooled, students topped the brownies with a sweet, gooey cookie dough topping. When it came time to taste test, there were plenty of smiling faces. “It’s good, but it’s pretty sugary,” Noah Ambrose said. Surette said that because this project involves a lot of hands-on learning, students are engaged. “Hands-on projects help keep them motivated to learn,” she said.